We use the highest quality, worldwide-known products with innovative formulas, uniquely designed for both women and men to enhance the natural beauty of the hair. We create beautiful haircolor with hundreds of L'Oreal Professional brand Majirel shades for natural to vibrant permanent color results. The Majirel family brand, combined with our creativity provides infinite color possibilities to meet your full satisfaction. We find or custom create your perfect color using the Koleston Perfect brand shades manufactured by Wella Professionals, the leader in professional haircolors. 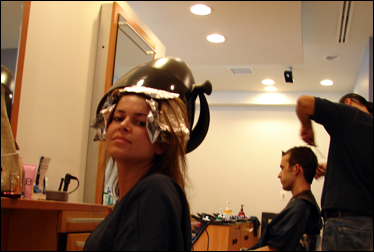 At Salon Tony, we have an eye for cutting-edge beauty and the latest hair trends. 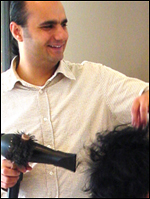 We offer professional hair care in an atmosphere that is elegant yet comfortable and relaxing. I started a life-long dream a long time ago in my native Beirut, moving on to the USA via Paris, France. My dream was to re-invent the Hair Salon, and to provide my clients with a superior salon experience through harmonious fusion of outstanding hair design, fashion, and superb customer service. Furthermore, I am a firm believer in continuous education and comprehensive training. That’s why I’m a member of the Haute Coiffure Francaise, travel to Paris twice a year to participate in the international hair show. This ongoing training enables me to provide my guests with the latesthair designs, advanced top quality hair care products, and hair styling services. I hope you’ll grant me the opportunity to demonstrate this to you. From 495 South take 123 north then left on Old Dominon Drive, Salon Tony is on your left hand side at 6858. From 495 North take exit 123 north then left on Old Dominon Drive, Salon Tony is on your left hand side at 6858. Coming from the District of Columbia Take GW Parkway exit Mclean then left Old Dominon Drive, Salon Tony is on your left hand side at 6858.